Boracay’s outsize reputation as the Philippines’ best beach has long overshadowed the country’s other seaside spots. Which is a shame, as beachgoers have plenty of alternatives in the Philippines. You'll find a beach on almost every island in the country (which has over 7,000 islands; do the math!). We’ve simplified your options and put together a top ten list of beaches to visit in the Philippines, ranging from secluded Anawangin to family-friendly Panglao — most of them offering plenty of bang for your beachgoing buck. Come to one of these beach spots during the Philippines’ dry-weather season (from January to May) and soak in the sun to your heart’s content! Boracay Island might be most well known for the White Beach on the west coast – after all, that’s where the bulk of the resorts, bars, restaurants and adventure providers are located – but don’t assume that’s all there is. Sure, White Beach may be one of the world’s finest beaches, with shallow waters and powder-fine white sand. But for watersports like windsurfing and kiteboarding, you’ll want to cross over to the opposite coast and Bulabog Beach. For land-based adventures, you can explore the island trails by horseback or ATV; or you can just retire for a massage at one of the island’s spas. How to get there: Boracay’s recently reopened to the public after a months-long break – to get here, you can fly in from Manila via Caticlan (10-20 minutes away by ferry) or via Kalibo (almost 2 hours away by bus and ferry). The island’s accommodations offer something for everyone, from budget and mid-range accommodations to luxury hotels & resorts. The Philippines island of Palawan, by itself, offers plenty of gorgeous beaches for your enjoyment, but you’ll find no better spot than the islands off Bacuit Bay, some five hours’ drive north of the capital Puerto Princesa. El Nido town is your gateway to exploring them all. The gorgeous karst (limestone) islets off El Nido are good for several days’ island-hopping and beach bumming. The alien landscape looks particularly striking in full daylight: the stark, sharp gray spires of the limestone standing out against the brilliant blues and whites of the sky and the sand. 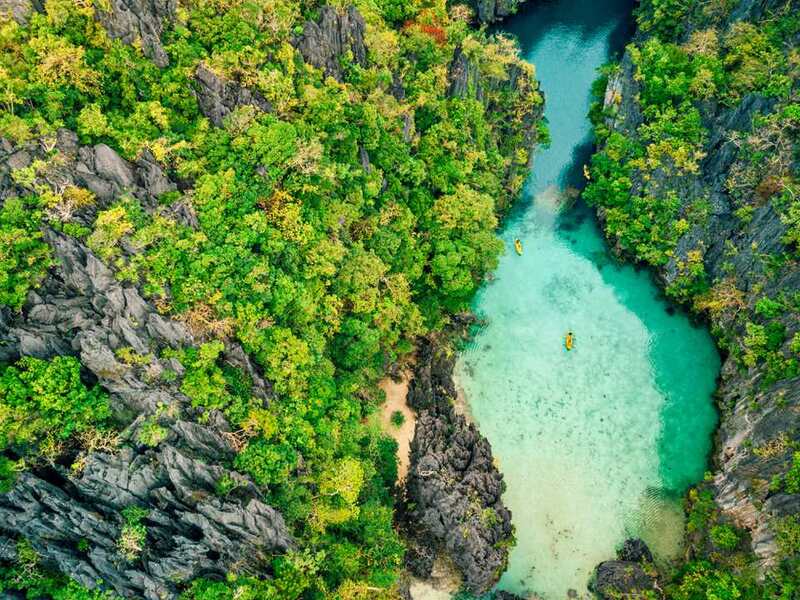 Sunning on the beach isn’t the only thing you can do while here — you can go diving around Bacuit Bay, paddle a kayak at Miniloc's Big and Small Lagoons; or go hiking amidst the karst outcrops off El Nido town. How to get there: To visit El Nido, take a bus, van or plane from the island capital Puerto Princesa; or ride a turboprop plane from Manila. Read about transportation to El Nido and compare rates on El Nido budget resorts. The eruption of Mount Pinatubo in 1991 had at least one good thing that came from it: the aftermath created Anawangin Cove, transforming a rocky shoal into a rustic, peaceful beach getaway in the shadow of Zambales’ sleeping volcano peaks. The gray sands (resulting from Pinatubo’s lahar) and casuarina tree cover make Anawangin an otherworldly escape, unmarred by crowds and infrastructure. Overnight visitors must bring their own camping gear, as there are no hotels onsite. You do get a natural playground all to yourself, from hiking up the nearby mountain slope to taking your boat-hire to beaches and coves off Anawangin, like Capones Island and Nagsasa Cove (scenic lighthouse for the former, snorkeling for the latter). How to get there: Given the half-day travel time from Manila, Anawangin is a true off-the-beaten-path getaway: take the bus from Manila to San Antonio town (Victory Liner, PHP 250), then tricycle to nearby Pundaquit town (PHP30), where you can hire a boat to take you to Anawangin (PHP1,000 for a 1-4 person boat). Few places in the Philippines beat Panglao Island as a family-friendly beach destination. Lacking Boracay’s congestion and high prices, while offering a sunny beach and island experience of its own, Panglao is your best bet for a beach vacation that hits all the right notes. Panglao's Alona Beach is great for sunning and swimming on its own, but you can hire a boat for a dolphin-watching trip off the island, or visit neighboring Balicasag and Pongtod Islands (the latter has a snaking white sandbar that’s well worth the excursion, pictured here). Beyond the beach, you can dine or party at Rona’s Corner, a junction near Alona Beach notable for its European-owned bistros and restaurants; or you can go further afield to Bohol Island (just across the bridge) where you can see tarsiers, visit the Chocolate Hills, or visit centuries-old churches. The Mabini Peninsula in Batangas enjoys a few key benefits: proximity to Manila, a handful of comfortable boutique resorts (compare rates on resorts in Anilao), and some of the finest diving in Southeast Asia. First discovered by foreign scuba divers in the 1980s, the town of Anilao attracts a steady stream of divers during diving season between October and June. Venture out to Sombrero Island to explore coral gardens swarming with red toothed trigger fish, nudibranch, pufferfish and the occasional turtle. If you prefer to stay above water, enjoy Sombrero Island’s white sand beaches, or try stand-up paddleboarding in the calm sheltered waters off Anilao. Or hit the trails and climb Mount Gulugod Baboy, a gently-sloping hill rising about 500 metres above sea level, its peak offering gorgeous views of Balayan Bay. How to get there: Take the bus from Manila to Batangas City (Jam Liner, PHP 200). From the Batangas terminal, ride a jeepney headed to Mabini (PHP40), which will pass by Anilao Port, from which tricycles (PHP100) can take you to your chosen Anilao resort. Siargao locals reject Boracay’s crowds and commerce, preferring to chase the perfect waves coming in from the Pacific instead. The resorts, surf shops and restaurants around Siargao’s General Luna town are all oriented around Siargao’s booming surfing industry that draws big kahunas (and some not so big ones) from all over the world. The world’s expert surfers go to surf breaks like Cloud Nine, which CNN describes as a with powerful waves that crash onto sharp coral beds, making it a doubly dangerous location. But don’t let that scare you off: Siargao also offers excursions to more laid-back stops like the Magpupungko tidal pool and the white-sand beaches off the coast, Naked Island (actually a sandbar); Guyam Island and Daku Island. How to get there: Daily flights to Siargao fly from Manila and Cebu. Oslob is famous or controversial) for one thing: its tame whale sharks that permit visitors to swim amongst them as they feed from plankton thrown off nearby boats. But the whale shark experience is not all there is to the place — it’s a surprisingly well-rounded beach stop that’s well worth the three hours it takes to get there from Cebu City. Pair your whale shark swim with a visit to Tumalog Falls in Oslob's highlands, where you can wash off the salt water under a cold and clean 300-foot waterfall. Or visit the ancient local town, founded in 1690 and home to Oslob’s century-and-a-half-old Catholic church. Finally, finish your trip with a “sutukil” by the beach, dining on grilled Filipino food, from Cebu lechon to ceviche-style fish to sour soups. How to get there: Most visitors to Oslob make a day-trip of it, preferring to stay at Cebu City in the interim. Buses to Oslob regularly depart from Cebu at the city's South Bus Terminal (N. Bacalso Avenue, Cebu City); book your bus to Oslob there. Bus fares cost PHP155 per way. Born from seven volcanoes, the remote but beautiful island of Camiguin owes much of its beauty to its fiery origins. The blackish sands of Camiguin’s beaches; the hot springs on the foothills of sleeping Mount Hibok-Hibok volcano; and the church ruins that testify to the rare explosions rained down by nature –— they're all a part of Camiguin’s nature-getaway charm, tied together with the verdant overgrowth and the sea surrounding it all. Camiguin is also a surprising Italian food destination, thanks to a community of expats who settled here and set up restaurants featuring their home cuisines. For homegrown eats, try the locally-grown lanzones fruit, or the cream-filled pastry pastel. How to get there: Daily direct flights connect the southern city of Cebu with Camiguin Airport. Accommodations on Camiguin favor homestays and boutique resorts. Compared to more popular beach destinations like Boracay, Siquijor’s beaches feel wilder, less populated, and more magical — in more ways than one. Rent a motorcycle or scooter, and make your way to each of Siquijor’s attractions on your own power. The popular Paliton Beach's coconut-palm-lined shoreline partners well with the clear sea, perfect for snorkeling and sunning in the summer. Salagdoong Beach appeals to more adventurous beach types, with cliff jumps that ascend up to 35 feet above the sea. Go further inland to discover Siquijor’s other natural features, like the cascading Cambugahay Falls and the mysterious Llihan Cave — or take a boat further out to Apo Island and its dive sites inhabited by giant turtles. You might also try Siquijor’s more man-made brand of magic — the local shaman healers specialize in all sorts of magical solutions to daily problems, from curses to love potions. How to get there: Book a flight from Manila to Dumaguete via Cebu Pacific or Philippine Airlines. From Dumaguete airport, take a tricycle to Dumaguete Port (PHP100) for sea-based connections to Siquijor (book tickets via Oceanjet). Siquijor's accommodations vary from one- to three-star, with a few beachfront boutique resorts to choose from. Several seasons and eight different international editions of the Survivor TV franchise have been filmed in Caramoan — in fact, the producers have leased parts of the peninsula for the next 20 years. The rest of Caramoan, located in the Philippines’ Bicol Region some 300 miles east of Manila, remains open to tourists seeking rugged natural beauty at a remove from civilization. Go island hopping around the smaller islands and take your pick from the beaches and lagoons hidden amidst the cliffs. Matukad Island, Lahos Island, and Little Catanaguan Island have white-sand beaches easily the equal of Phuket or Boracay, if not exactly as accessible; the waters off these islands are prime spots for stand-up paddleboarding, kayaking, and snorkeling. At higher elevations, Caramoan’s limestone cliffs are perfect for climbing (and sometimes jumping from into the sea); Caglago Mountain has a 500-step climb that leads up to a massive statue of the Virgin Mary. How to get there: Buses regularly ply the route from Manila to San Jose, Camarines Sur, whose Sabang Port is the main entryway into Caramoan. (Book your seat on one of the following bus booking sites: PHbus.com, biyaheroes.com, or bicolisarog.com.) From Sabang Port, a passenger boat (PHP120) connects you to Guijalo Port in Caramoan, where tricycles wait (PHP300) to take you to the town center for accommodations.